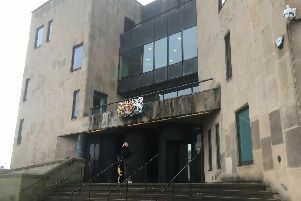 A Wigan courtroom reacted with shock after being shown footage of a three-year-old boy being struck by a stolen van and sent flying 17 metres across a car park. Leo Durrington was walking along Wigan Road in Leigh on the morning of October 30, with his mother, when the speeding white Ford Transit ploughed into him, hurling him like a ragdoll into the car park of the Tamar pub. It was being driven by a 16-year-old Abram boy, with a 15-year-old in the passenger seat. Neither boy can be named for legal reasons. They failed to stop, fleeing the scene of the horrific crime while police officers stopped to aid Leo, whose heart stopped multiple times while 999 crews treated him in the car park. Yesterday, both youngsters wept as they entered the courtroom for their separate sentences. The younger boy was first to appear before the court, and was given a referral order and £20 victim surcharge, after admitting to being carried in a stolen vehicle. The elder teen was sentenced at Wigan Youth Court to one year in a Young Offenders’ Institute - six months in detention, and six on probation after pleading guilty to causing serious injury by dangerous driving and failing to stop. He admitted handling stolen goods, driving without a licence and driving without insurance. He also pleaded guilty to six other charges including criminal damage and common assault - which received no separate penalty for these offences. During the hearing people in court listened in stunned silence as prosecutor Beth Pilling revealed harrowing details of the incident. It was shortly after 10.35am on October 30 when officers on patrol tried to stop the stolen Ford Transit Connect, after an automatic number plate reader flagged up the vehicle as stolen. When the vehicle pressed on regardless, a brief police chase ensued, during which the fleeing suspects reached speeds of up to 60mph. The van took a sharp turn at the roundabout onto Wigan Road, mounted the curb and hit Leo. Officers immediately abandoned the chase and rushed to give first aid to the badly injured child, but the van did not stop and drove off in the direction of Twist Lane. The vehicle was later recovered by officers on St John’s Street in Abram where the duo abandoned it. Following extensive public appeals, the 16-year-old driver was located and subsequently arrested. The 15-year-old passenger handed himself in at a local police station a couple of hours later that evening. During interview, the eldest teen admitted to purchasing the stolen van for £300 the day before the collision. Leo, who turned four just day after the collision, remains in hospital, with his parents sleeping by his bedside every night. His condition has “improved considerably”, but he still has some difficulty speaking and walking, according to Ms Pilling. Sgt Lee Westhead of GMP’s Serious Collision Investigation Unit, said: “The devastation caused is all too apparent. Leo’s family has been left distraught by what happened that day and I am glad that we were able to identify these teenagers so quickly.